Another piece from the robo-chickens series. Thank you all voting this piece to be bribed! i'm so happy that this got bribed! congratz! Congratulations on bribed! Glad to share it with this one! This is really awsome and congrats on the bribe! I love the idea that there's a whole "robo-chicken" series! Nice one! 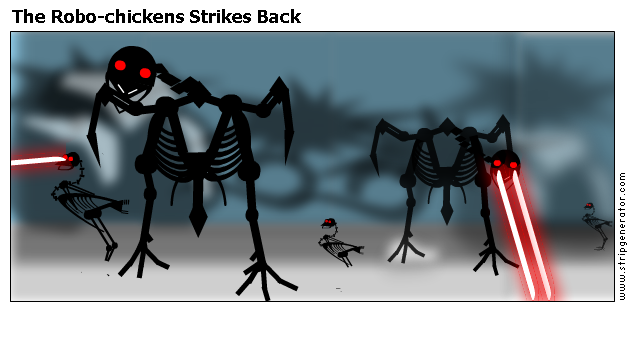 I love these robo chickens - reminds of the War of the Worlds. Brilliant!! this is an awesome piece of work. Those are some damn cool robo chickens! No wait don't cut their heads off, they'll just run around like a ... well you know, causing even more damage! Please vote and comment it. Thanks!